Our attention generally follows the movement of our eyes, i.e. our consciousness is usually focussed on whatever our eyes are looking at. If we want to focus our awareness on something that is non-visual we tend to de-focus our vision or close our eyes to help us concentrate. Our eyes instinctively look up to the left when we access our rational mind (mental body) and up to the right for the creative mind (causal body). This phenomenon is related to the rapid eye movements we make during REM sleep. Dreams are a mixture of recall and creativity so our eyes constantly flicker when we dream. REM sometimes also occurs during meditation – some practitioners mistakenly think it is an undesirable distraction that should be prevented, but it is a perfectly natural phenomenon. A psycho-therapeutic technique called Eye Movement Desensitisation and Reprocessing (EMDR) uses forced rapid eye movements to stimulate both sides of the cortex in order to release traumatic memories. The arrangement of the subtle bodies during dream sleep – the physical body sleeps but the etheric, emotional and mental bodies remain active. Waking State: the physical body is active, the physical brain is externally focused and the emotional-mental body is present. Dreaming State: the physical body is passive, the physical brain is internally focused and the emotional-mental body is absent. The events, emotions, thoughts, memories and lessons we learnt the previous day are all reviewed, organised and stored in our lesser causal body while we dream. The process can be compared to defragmenting the files on your computer (persona) and backing them up to an external storage device (lesser causal body). The monad rapidly switches its awareness between the three units of the triad in order to organise the data, and this causes the rapid eye movements. The vibrations within the persona (etheric, emotional and mental bodies) set up sympathetic vibrations in the lesser causal body, which produce a permanent copy of the day’s lessons and experiences. During the process, memories, desires, emotions hopes and fears are churned up in the subtle bodies and are perceived by the nearby etheric body. The physical- etheric brain tries to make sense of these random thoughts and feelings by compiling them into a story which we experience as a dream. External Physical-Etheric Stimuli: The absence of the higher subtle bodies causes the physical- etheric brain to become overly sensitive to stimuli from the physical body. Any physical stimulus, such as a touch or a sound, is blown out of all proportion in our dreams. Being under the duvet may give rise to a dream about being buried alive, or a banging door may give rise to a dream about being shot. Internal Physical-Etheric Stimuli: If there are no external stimuli for the physical-etheric brain to seize upon it may create a chain of thoughts from its recent memories. External Emotional or Mental Stimuli: During sleep our emotional and mental bodies are free from the dampening effect of the physical body so their sensitivity is greatly increased. Other people’s fragmented thoughts and emotions that randomly drift through our subtle bodes are seized upon by our consciousness. Even the slightest sexual stimulus passes down the consciousness thread into the physical body and causes “morning glory”. Internal Emotional or Mental Stimuli: Our frame of mind and the last thoughts we have before falling asleep leave residual vibrations in our subtle bodies which often influence our dreams. Our out-of-body experiences from the preceding period of deep sleep also leave residual vibrations which can make their way into our dreams. If stimuli are received from more than one source, the monad will create a dream from all the different perceptions, which can give rise to some very strange dreams. Dreams can originate from any of our subtle bodies and have a variety of different causes, but only people with causal consciousness (enlightened or above) are able to ascertain the precise cause of a particular dream and therefore give an accurate interpretation. Associative Dreams: Dreams are often fluid, non-sequential and bizarre, especially if they are based upon events relating to the emotional or mental worlds. The physical-etheric brain has no experience of these multi-dimensional worlds and has great difficulty in making sense of them, so it often substitutes a similar person, object or event in an attempt to make some sense of what it perceives. Symbolic Dreams: Some dreams are symbolic and occur when our guardian angel or higher self try to tell us something. This method of communication only works when the waking consciousness is able to decipher the symbolic message; otherwise it is a waste of time. There is no universal code (or book) which can be used to interpret dreams because they are all personal. Lucid Dreams: Lucid dreaming is one’s conscious perception of the dream state, resulting in a much clearer or lucid experience that sometimes enables direct control over the dream. The so-called lucidity comes from the physical brain being partly internally focussed and partly externally focussed. Lucid dreaming is no more real than regular dreaming; in fact it is a cross between regular dreaming and day-dreaming. Day-dreaming occurs when waking consciousness turns its attention inwards; away from the outside world. 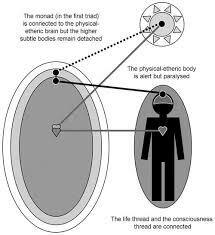 The consciousness thread is not detached and the emotional-mental body does not leave. Prophetic Dreams: Prophetic dreams or premonitions demonstrate that our monad’s meta- consciousness has a wider range of perception than our normal waking consciousness, which actually extends beyond the present and into the future. Refer to the section on precognition in Chapter 14 for further details. Dreams of Past Lives: Young children’s dreams may include memories from their past lives. The subtle bodies, being new for each incarnation, do not contain any memories of previous lives, so dreams of past lives originate directly from the memory of the triad permanent atoms. Young children can to access memories from their triads, because they have not yet forgotten who they really are and they don’t identify themselves as their physical bodies in the way that most adults do. The waking consciousness finds it much easier to recall memories that were actually experienced, rather than those that were just witnessed or heard about. Dreams are created by the meta- conscious and “viewed” by the waking consciousness, so unless a dream is very intense it will be forgotten in the next sleep cycle. In order to remember a dream we must consciously know the pathway that leads to the memory of the dream, and this requires our physical brain to awaken from its internally focussed state and become externally focussed. It is common to wake up briefly at the end of a period of REM sleep, since we are on the verge of normal waking consciousness anyway, but because our bodies are so relaxed we usually drift back of to sleep immediately. However, if we go to sleep with the intention of remembering our dreams we will usually wake up after each one and be able to recall it. People sometimes have dreams that seem to last many days or years, yet only a few minutes of physical time have passed. This is because we have nothing to objectively measure time against in our subjective dream world. Dreams such as the one described earlier where a person shot is in the dream and simultaneously woken by the door bang clearly only lasted a fraction of a second. The monad is meta-consciously aware of the bang a fraction of a second before the waking consciousness becomes aware of it, which is plenty of time to devise a dream that incorporates the bang. A rapid return to the physical results in the physical body jumping or jolting as the emotional- mental body snaps back into place. In such instances, the monad often creates a falling dream where the impact with the ground corresponds to the emotional-mental body snapping back into the physical-etheric body. The dream is created in the fraction of a second between the consciousness thread being reconnected and the subtle bodies returning.